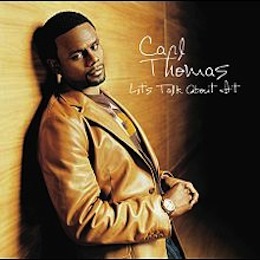 Carl Thomas (born June 15, 1972) is an American R&B singer from Aurora, Illinois. Thomas sang around Chicago and became a member of The Formula. He branched out however, and traveled to New York where he sang at clubs during open-mic nights. One such performance caught the eye of Sean “Puffy” Combs who signed Thomas to Bad Boy Entertainment in 1997. In early 2000 his single “I Wish” was released, which topped the R&B charts, and set the stage for his debut album, “Emotional” later that year. On the success of the single, and the album’s other singles charted on the R&B charts including, “Summer Rain” at #18 and the title track “Emotional” at #8. The album peaked at #9 on the U.S. Billboard 200 Albums chart and was certified platinum. Later rapper Jay-Z’s “I Just Wanna Love U (Give It 2 Me)” featuring Pharrell sampled Thomas’ “I Wish” on his 2000 album “The Dynasty: Roc La Familia.”His second album, “Let’s Talk About It,” was released in March 2004.